I just added some blennies to the seahorse tank for the same reason. Seahorses are darling but they spend much of their time boringly hitched. 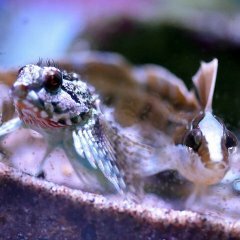 Blennies are a very fun fish the way they pop in and out of holes and crevices. Image links will all be breaking pretty soon, Flickr is limiting their free accounts, so will no longer be using their service. Yeah, I use them too. I don't have 1000 photos though so I think it will keep working but I'll have to find a new host for future pics. I had somewhere in the 5-6K neighborhood, mostly auto uploaded photos from my phone. i was pretty pissed when i got the email about this. what are you switching to? I honestly don't know yet. Google photos is out since they stopped providing image links. Photobucket has strict limits, as well. Changing skimmers. The Icecap K2-120 was super expensive, but it doesn't seem to perform well in this tank. Going to a tried and true Reef Octopus 110INT. Anyone wants the Icecap for cheap, PM me. 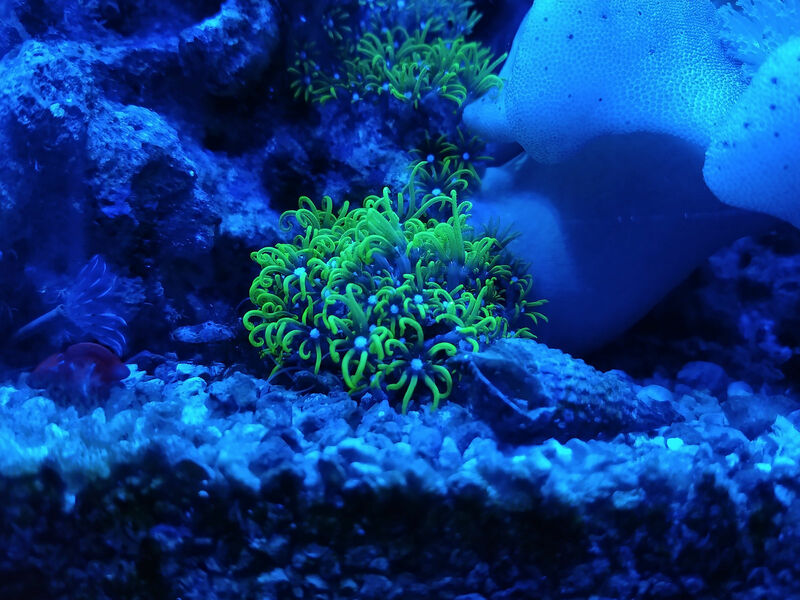 Got a molly from Petco and a sebae anemone (Heteractis crispa) from the LFS yesterday. 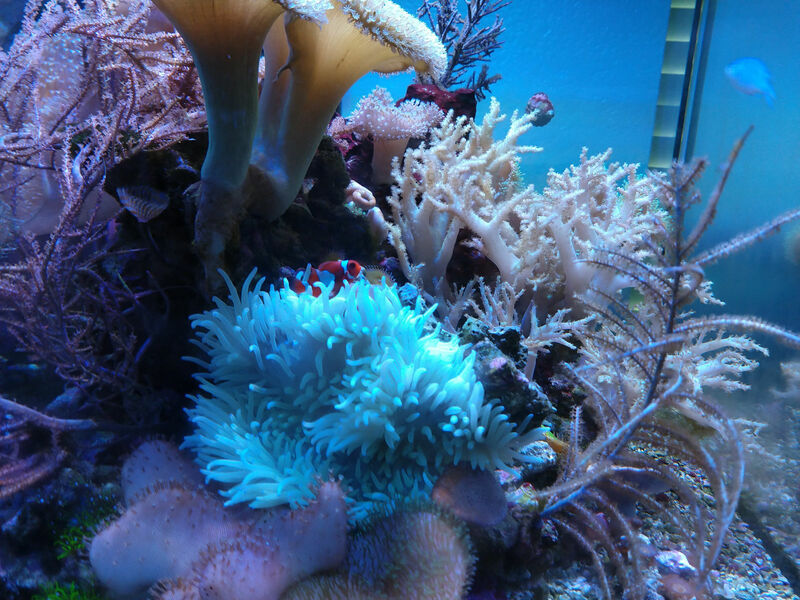 Molly seems to have survived the transition to saltwater since it is still alive and swimming around, and this morning my maroon decided he liked the anemone. Mother####er turned his nose up to the nice (though small) magnifica anemone I had gotten a while back (that wasted away, sadly). 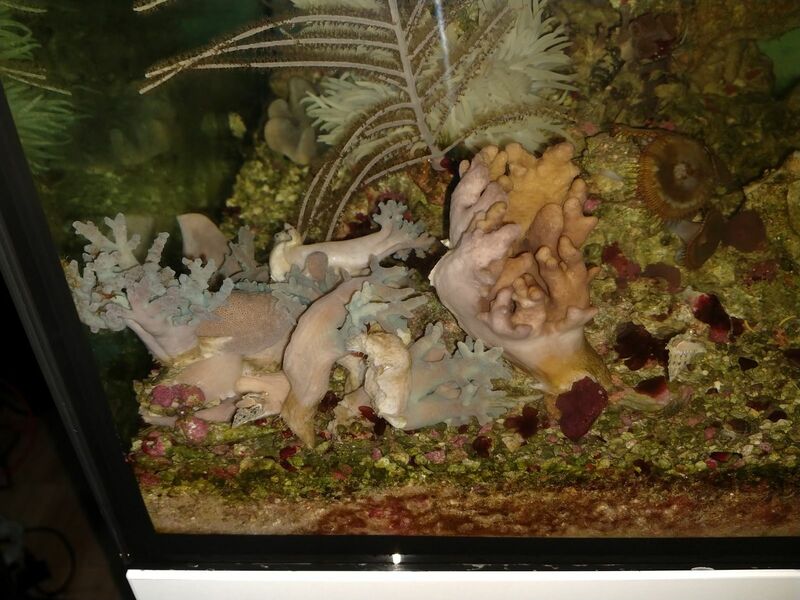 Anemone is bleached, but it had a very strong foot and sticky as hell tentacles, so it should color up in a few months. Tentacles have a very slight fluorescence to them, which is very strange for Heteractis nems. The tank is looking great Ben. I have often thought about putting mollies in the seahorse tank. I have read that other pony keepers do it for algae control. What is your salinity? I keep it at 35ppt. Mollies are excellent at algae control. They don't have scraping teeth like some tangs and foxface do, but any kind of filamentous algae is fair game, and they will still try and scrape from flat surfaces like the glass. Thanks for the info. 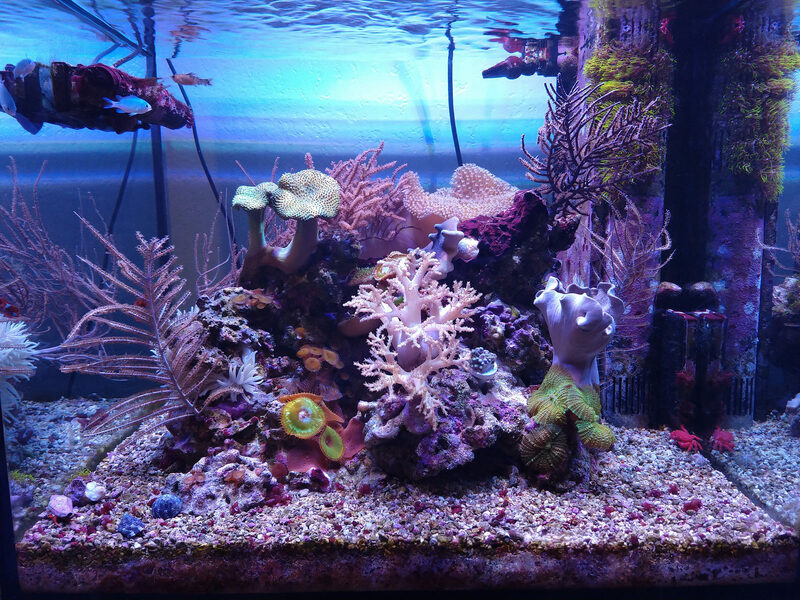 I do run the pony tank lower since its about fish more than coral. Its around 31ppt so maybe it'll be easier for me to acclimate some. I have had excellant luck with ghost shrimp. Best method has been the dump & pray rather than a slower acclimation, it is how they do it here in the wild. Great to see a mini update Ben. Hope you are well! 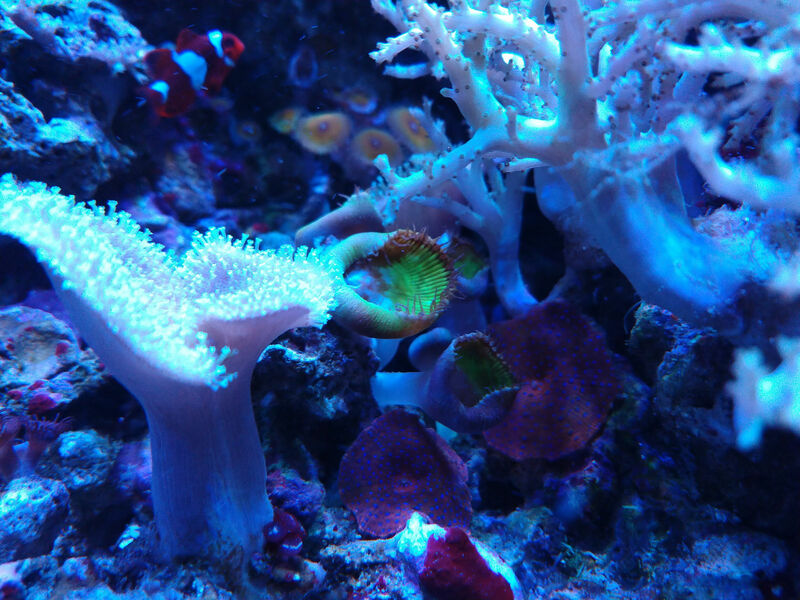 Clownfish already knows to feed the anemone, so it should definitely be coloring up sooner rather than later. 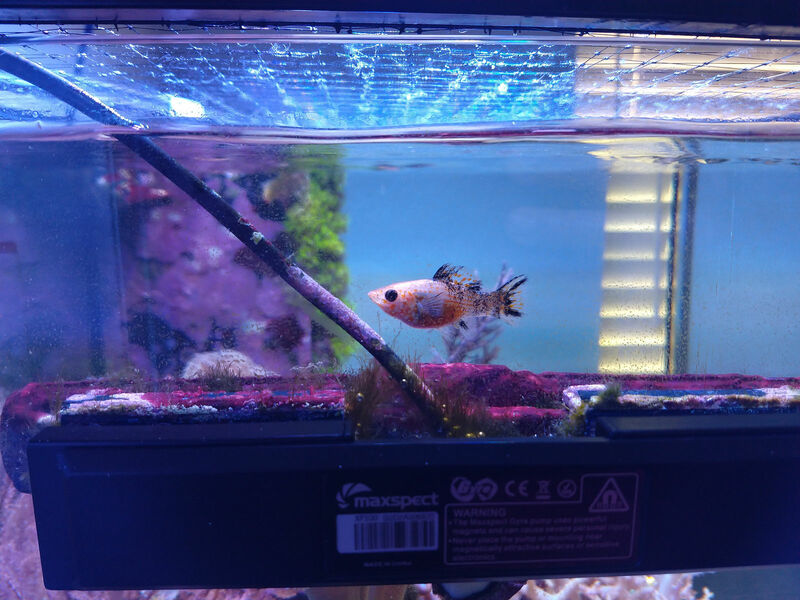 LFS didn't want it, but one of the workers at Petco and I were talking and I brought up the stuff, and he said he'd take it, neato. 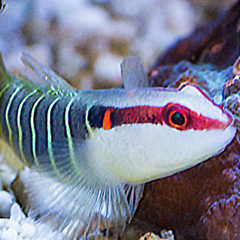 Got a ruby red dragonet, two chromis, a strawberry crab, and two more trochus snails at the LFS. I went to our lfs today and it had a darling ruby red dragnet but it was not eating frozen yet so I did not buy it. I came home with an orange spot blenny instead. I will enjoy seeing pics of the new purchases! You probably won't find any from any store that will be eating frozen from the getgo, even though dragonets are easy (relatively, of course) to breed at home or in a commercial farm. These are collected in the wild by the thousands, so there is no market for expensive captive-bred specimens. This is the same reason that ORA no longer breeds mandarin dragonets, they are expensive to produce and cannot compete with a $10 wild-caught specimen. that's a bright red crab! Is it a red mithrax? My lfs works on getting them to eat frozen and when they do marks it on their chart. I will be watching for some that are doing that.